This blog is be about the Maya Calendar which I am now back in mesoamerica studying some more (as long as the jungle cat sized mozzies stay away from me while I type). The first thing I noticed here is that mayans smile and say hi to eachother and wave, it's sort of like a,"hi there fellow human being, hope your happy"......a far cry from England were many people look at the floor when passing strangers...wow, there is so much fear in the UK. A consciousness shift is needed, but this leads us onto one of the theories regarding the Maya Calendar which was mentioned in the History and 2012 Chapters of Wayki Wayki. We touched upon Dr Carl Calleman's theory, and he has a recent interview here. Though polar opposite to Calleman, Barbara Hand Clow, author of The Mayan Code, has a recent interview here. Both interviews complement the other very well. I am confused as to why this Calendar is not mentioned in schools and as to why no-one really knows about it? A media and curriculum black out? surely not? Such slander from me today. People keep saying that time is speeding up too, technology is now doubling up every few years, a choice of a coffee is now silly compared to 10 years ago and the past is going away quicker, one month ago feels like a year in some cases. is this a new phenomenom related to photon light from the centre of the galaxy towards our DNA? DNA is a transmitter receiver of photon light let us remember, and is this what the calendar is measuring? On another maya calendar front, I have been talking to some shaman about the dreamspell look at the calendar, this was channelled by Jose Argelles in the 1990's and combines many worldcalendars and the moon cycle, it is said to be a 'game' by the originator. This version of the calendar is new-age nonsense, to prove this, know it just stops and waits a day when we are on a gregorian leap year. It is a slave to the gregorian calendar, and runs in different cycles to the traditional Quiche Calendar. Be careful when researching. At the famous Maya site of Palenque recently, I overheard a so called guide (who was well in with the shops and restaurants scam) tell some tourists that the prestigious maya had the long skulls simply due to putting their heads in a wooden frame - for me, this is nonsense as we explained in Wayki Wayki. 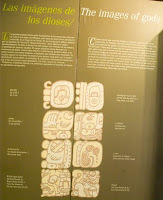 It also seems the Maya where into shamanic medicines similar to ayahuasca, they had medicinal shaman and many pictures at the sites show potions and snakes and serpents, representative of the celestial worlds. Look below to see how the Maya were involved in celestial worlds, look at the carving of a potion being passed - is this a shamanic tea that has gone on in these regions for thousands of years? The Maya believed in underworlds and life after death, "Beneath Pacal are the 'unfolded' jaws of a dragon or serpent, into whose mouth Pacal the Great descends. This is a common iconographic representation of the entrance to the underworld." In Palenque there is a part of the palace called 'Sak Nuk Naah' (White Skin House) — why was it called this? this part of the palace, E, had a throne room too. Do the Maya follow the story of white skinned (possibly Atlantean priests) men with unbelievable knowledge we hear from all around the ancient world? 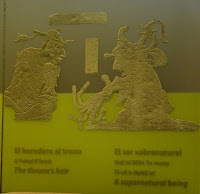 For me, the Maya puzzle keeps thickening, I cannot rule out the calendar is not from earth, I cannot rule out it came from 4th dimensional entities in astral viewing via shamanic medicines, I cannot rule out that the first Maya where white and came from Atlantis. I can rule out that the Maya were just barbaric warriors, and that they knew all about the procession of the equinox, Jupiter, Saturn, Mars, Mercury and Venus conjunctions by watching the stars without telescopes, and that they put their heads in blocks of wood......because that really is nonsense.